Okay, so you’ve got your phones all set up and connected, ready to go. You’ve got your DaFeeder Preview Dialer ready to feed those leads to your call centre associates. With your business ready to make contact with the world, there is another very important aspect that you need to have locked in. And that’s your customer service regimen. But you knew that already, didn’t you? You can have the greatest phone system in the world, but without the greatest customer service representatives in the world, you may not be able to make that great impression that you were hoping your call centre would give you. At MeloTel, we pride ourselves on our customer service. We do our best to treat our customers the way we would like to be treated. So it’s never lost on us that, we too, are customers. And we’ve been on the phone collectively a whole lot more than we’d like to admit with people who have next to no telephone etiquette. What’s worse is that a lot of these individuals were representing different companies through their positions at call centres. Let’s go through five simple tips on how to use the phone wisely. 1. Watch Your Tone. We’re sure we’ve asked this before, but did you know that you can “hear” a smile? Encourage your reps to always smile during their conversations. Not only will this improve their overall work days, but it will help for the tone of their voices to sound a lot more pleasant and bright. Customers like to speak to friendly, knowledgeable reps. Be sure they sound that way! 2. Use Courtesies. A good rule of thumb is to utilize your P’s and Q’s. Add to that some A’s by way of apologies. For example, if you need to place someone on hold, it gives you an opportunity to use all three. “May I please place you on a brief hold while I look into that for? ” Then follow that up with, “Thank you for holding, I apologize for keeping you waiting.” These courtesies work wonders. 4. Go Over And Above. Sometimes just doing your job isn’t enough. Customers like to see additional efforts being made to make them happy. These little “extras” can go a long way in securing the loyalty of your clients. It can be as simple as placing a note on the account (which you can do in DaFeeder) about a nickname you can use to address your client. Make efforts to show each of your clients that they are special to you. 5. Call Back. There is nothing worse (some would say) then accidentally getting disconnected from a customer service representative only to have to call back and go through the entire process of getting someone on the line again. 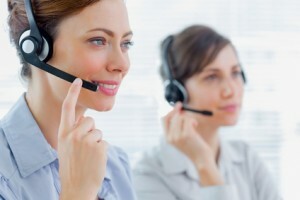 Give your customers the courtesy of giving them a call back if they happen to get disconnected from your line. They will appreciate it.